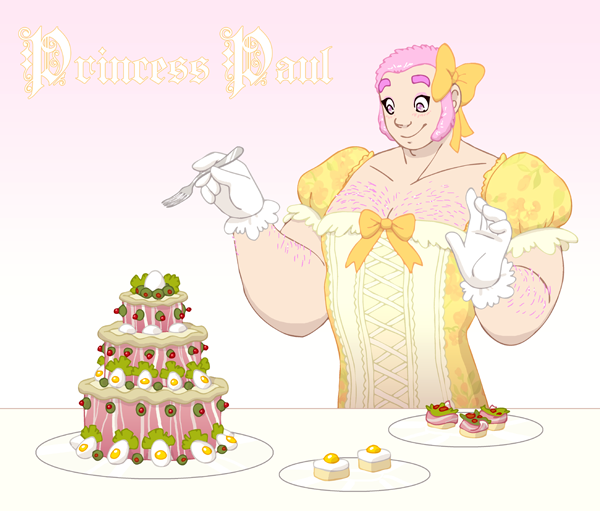 A big strong guy like Princess Paul needs lots of protein. I didn't want the second Princess Paul picture to be silly, but I needed to get this out of my system. Please keep up with Princess Paul! I also want all his dresses. ALL OF THEM. i need Princess Paul in my life. please make him a thing. @Spanishfan My sister's husband got that kind of cake on his birthday. Rye bread as a base, topped with ham, eggs, cheese and a few veggies, held together by cream cheese and mayo. Pretty damn awesome. PLEASE send us all the recipe. We need this. I dig the pink hair! By the way, this is delightfully absurd as a concept. Thank you.